The appearance of this fish is quite spectacular due to transparent body (allowing you to see all their internal organs and bones) and sensory whiskers (which they use to find food). They must be kept in groups of at least 6. 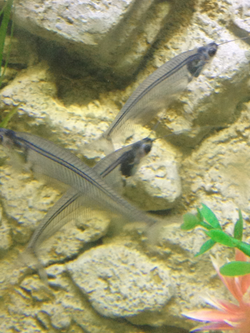 These fish have never officially been bred in the aquarium. However, there are some claims of people having done it. Sexing: It is almost impossible to determine the sexes of these fish.